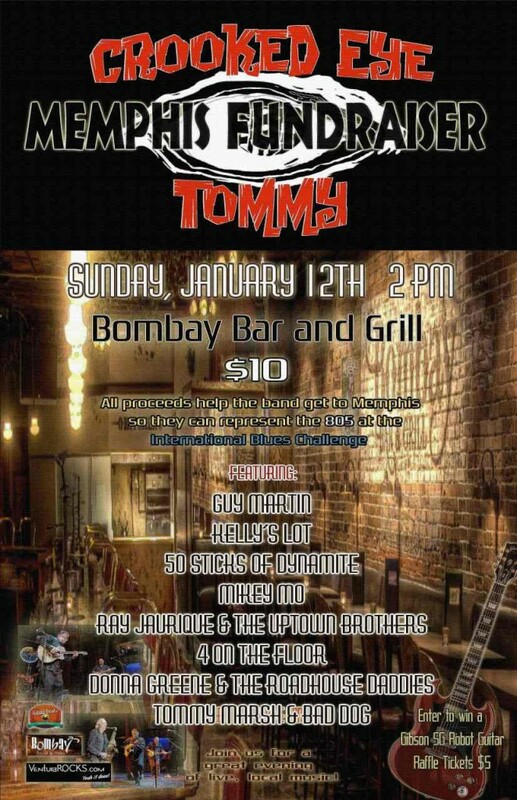 CROOKED EYE TOMMY is having a raffle to raise money to get to MEMPHIS for the INTERNATIONAL BLUES CHALLENGE. The ‘Going To Memphis’ Fundraiser for Crooked Eye Tommy, Jan 12th with Tommy Marsh and Bad Dog, Guy Martin Music, Kelly’s Lot, 50 Sticks of Dynamite, Mikey Mo Band, 4 on the Floor, Donna Greene & The Roadhouse Daddies, Ray Jaurique & the Uptown Brothers. 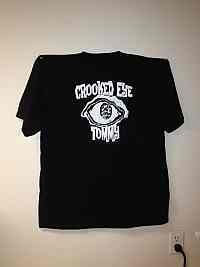 You can purchase your tickets and help support Crooked Eye using this PayPal box . Your donations go to tommy@tommymarsh.org. For each 5 dollar donation you will get 1 ticket to win the BEAUTIFUL GIBSON SG ROBOT Guitar. The Gibson Robot SG Electric Guitar meets the demands of guitarist wanting to get their hands on the Robot self-tuning guitar. Featuring a performance-safeguarding Neutrik jack, which secures the cord into the guitar, the Robot SG offers the classic styling, performance, and power of the legendary SG with the revolutionary Robot automatic tuning system. A slim, solid mahogany body is fundamental to all SGs. The Robot SG Special’s light body delivers the SG’s legendary thick, warm tone and singing sustain. The mahogany is personally inspected and qualified by Gibson’s team of skilled wood experts. Once inside the Gibson factories – where humidity is maintained at 45 percent, and the temperature at 70 degrees – all woods are dried to a level of equilibrium by ensuring the moisture content does not change during the manufacturing process. This guarantees tight-fitting joints and no expansion, and helps control the shrinkage and warping of the woods, in addition to helping reduce the weight. It also helps with improving the woods’ machinability and finishing properties, and adherence to glue. Consistent moisture content means that a Gibson guitar will respond evenly to temperature and humidity changes long after it leaves the factory. At the heart of Gibson’s revolutionary Robot SG Special are its ground-breaking controls. At first glance, the four control knobs seem to be indistinguishable from those on any other SG. But look again. While the four knobs do provide the standard tone and volume controls for each of the two pickups, the Multi-Control Knob (MCK) – the one with the illuminated top – serves as the master control for all aspects of the Robot SG Special’s amazing, self-tuning system. The MCK is what is commonly referred to as a push-pull knob. When in the normal position (down), it behaves as a regular volume or tone pot. When the MCK is pulled out, the Robot SG Special’s radically new self-tuning system is activated and ready for use. It immediately places the Robot SG Special in standard tuning mode (A440). A quick turn of the MCK presents six factory presets, all of which can be customized. At any time, you can also restore the tunings to the factory presets and start all over again. The LED display on top of the MCK also lets you know when a string is out of tune, or when all strings are in tune, and even when the tuners are turning to get them in tune. It even guides the setting of accurate intonation. At the end of the tuning process, the blue lights on top of the MCK flash. Push the MCK back in and it’s ready to go. The only thing you have to do is play. Gibson’s revolutionary Robot SG Special is unique in many ways, but the robot-like Powerhead Tuners that grace the headstock are extraordinary. Pull out the Robot SG Special’s Multi-Control Knob (MCK) and watch the Powerhead Tuners spring into action. It takes only a few seconds for the Powerhead Tuners to tune the Robot SG Special to the desired tuning. Each tuning peg is equipped with a tiny, put powerful, servo motor that kicks into action once the system is activated. The Powerhead Tuners rely on the strings themselves to send the signals, eliminating any potential for interference. Made of lightweight metal with a satin nickel finish, the Powerhead Tuners weigh only 46.5 grams each. A standard Gotoh tuner weighs in at 49 grams. Neutrik has been making superior electronic interconnection products since 1975, making them the logical choice to supply the performance-safeguarding jack in Gibson’s revolutionary Robot SG Special. Like many Neutrik products, the jack in the Robot SG Special is manufactured from strong, high-grade thermoplastics and housed in a rugged diecast nickel shell. A retention spring inside the jack ensures optimum grip on any guitar cable, thus avoiding the chance of lost connection.